I really can't believe that I have not shared one of my favorite accessory purchases of 2009 with you! As I was getting dressed today and was putting on a pair of my fav jeans I noticed that I had a slight "gap". You girls know what I mean! 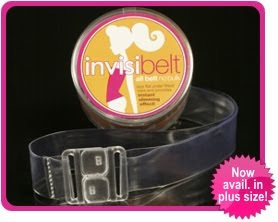 So I pulled out my invisibelt and I realized that I needed to share this great invention with others! Actually I am so mad at myself for not coming up with it first. The invisibelt is a great, super flat, super fly belt that you can wear with any of your jeans and pants without getting that awful belt buckle bulk under your shirt. It lays flat under your fitted shirts. I bought mine last year and have loved it ever since - highly recommend. It is a Deal!